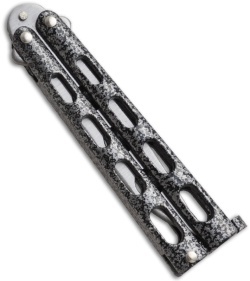 Small Trainer version of the popular Bear Butterfly Knife. This knife features a tough epoxy powder coating over zinc handles. The handles feature a skeletonized design to reduce weight. Stainless steel blade with dull edges. Durable tang pin construction. 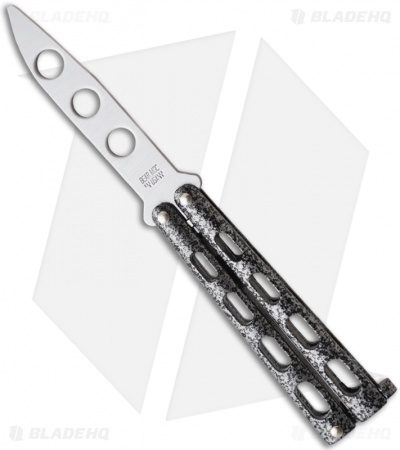 A nice USA made budget butterfly knife. This was my first balisong and my introduction to flipping. It's a solid knife, if a bit short. The blade is straight off of the 114, so it will come in contact with the latch a lot more than a standard 114.